In 12-inch skillet, heat oil over medium-high heat. Add onion and garlic; cook 2 to 3 minutes, stirring constantly, until onion is transparent. Reduce heat to medium. Stir in wine; cook 30 to 60 seconds, stirring constantly, until slightly reduced. Stir in all remaining sauce ingredients except bell pepper and parsley. Cook uncovered about 7 minutes or until slightly thickened. 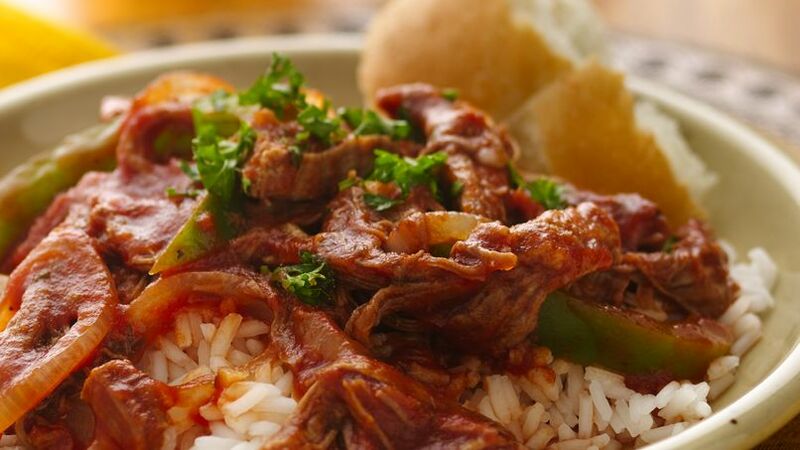 Stir in shredded beef and bell pepper. Cover; cook 5 to 8 minutes longer, stirring occasionally, until bell pepper is crisp-tender and beef is thoroughly heated. Sprinkle with parsley before serving. *At this point, beef can be refrigerated for 1 day or wrapped and frozen for up to 1 month. Muir Glen is a registered trademark of Small Planet Foods, Inc.